If your child has a toothache, there’s good news — and not so good news. The good news is the pain rarely indicates an emergency. On the downside, though, it may definitely be something that needs our attention. Here, then, are 4 things you should do as a parent when your child tells you their tooth hurts. Try to find out exactly where the pain is and how long it has hurt. Ask your child which tooth or part of the mouth hurts. You should also find out, as best you can, when the pain started and if it’s constant or intermittent. Anything you learn will be useful information if you bring them to the office for an examination. And, any tooth pain that keeps your child up at night or lasts more than a day should be examined. Look for signs of recent injury. 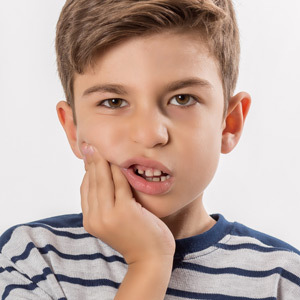 Your child may have suffered a blow to the mouth that has damaged the teeth and gums. Besides asking if they remember getting hurt in the mouth, be sure to look for chipped teeth, cracks or other signs of trauma. Even if there aren’t any outward signs of injury, the tooth’s interior pulp may have been damaged and should be checked out. Look for signs of dental disease. Take a close look at the tooth your child’s complaining about: do you see brown spots or obvious cavities? You should also look for swollen gums or sores on the inside of the mouth. If there’s been no apparent injury, these could be signs of infection related to tooth decay. Try to relieve pain symptoms. If you don’t see anything unusual, there may be a piece of candy or other hard food debris between the teeth causing the pain — gently floss around the tooth to dislodge it. If the pain persists give appropriate doses of ibuprofen or acetaminophen (not aspirin). If there’s swelling, you can also apply an icepack on the outside of the jaw. In any case, you should definitely schedule a visit with us for an examination.